Americans love peanut butter in their cooking, their candy bars, in peanut butter and jelly sandwiches, and especially in Peanut Butter Cookies. Jean Anderson tells us in her excellent book The American Century Cookbook that the first published cookie recipe using peanut butter appeared in 1915, but it wasn't until 1936 that a recipe resembling the peanut butter cookie of today appeared in Ruth Wakefield's book Ruth Wakefield's Toll House Tried and True Recipes. Of course, the classic crisscross pattern make them instantly recognizable and that 'sweet and salty' flavor combination make them irresistible. 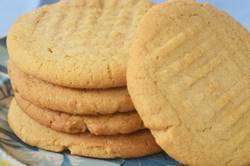 There is an ongoing debate about whether smooth or crunchy peanut butter make the best cookies. There are statistics that say women and children prefer the smooth type, while men go for crunchy peanut butter. Peanut butter has been an American favorite ever since its introduction at the 1904 St. Louis World's Fair. Dr. Kellogg is credited with popularizing it in the 1890s when, as a vegetarian, he wanted a substitute for what he called "cow's butter". His answer was "nut butters" and since peanuts (really a legume, not a nut) were the cheapest nut, that is the "nut butter" he focused on. Peanut butter was first touted as a "health" food and recipes for making and using peanut butter were in many vegetarian cookbooks by the early 1900s. Today peanut butter is so popular that over half the American peanut crop goes to its making. Peanut butter is a smooth paste made from roasted peanuts. The peanuts are ground, and then salt, a sweetener, and sometimes a stabilizer (to keep the oil from separating) are added. There are two types of peanut butter, and the ones that are labeled "Old-Fashioned" or "Natural" do not contain a stabilizer which means the peanut butter will separate and you will have to stir the peanut butter before using. Now if possible, when buying peanut butter, try to buy ones that do not contain trans fats, which are labeled as "partially hydrogenated oil" or "hydrogenated oil". Peanut Butter Cookies: Preheat oven to 350 degrees F (177 degrees C) and place rack in center of oven. Line two baking sheets with parchment paper.